This measuring system provides high speed vessel operators with a near real-time measurement of any significant wave height being encountered. The information can be made available as a digital display on the bridge and can also be supplied to a Voyage Data Monitoring or Hull Condition Monitoring System. Designed for high speed catamarans but can be used on conventional vessels. Vessel motion is compensated for by a series of proprietary processing algorithms. 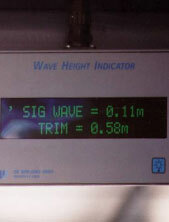 Uses a compact bridge display to present an operator selectable trailing average of significant wave height with an overall system accuracy of better than +20 cm. Easily interfaced to other shipboard systems.